Last Sunday, Delhi Food Walks conducted its first community food walk of 2015 – the Kebab and Biryani Trail in Old Delhi. The food walk started with galouti kebabs and ended with the famous sutli kebabs of Bazar Matia Mahal. The highlight of the kebab trail was Bhaijaan Kebabs. The name of the shop itself will arouse the curiosity of anyone visiting the shop. When I first visited the shop, I was expecting a well-built, husky fan of the Bollywood star Salman Khan. However, I met the rather gracious owner, Mohd. Shamim, who started selling kebabs three years back just out of his passion and love for kebabs. The shop is run by his son, Ubaid, and his cousins, Javed and Ameen. Let me tell you the location and directions to reach his shop. Keep walking straight in Bazar Matia Mahal until you reach Chitli Qabar Chowk, then take a right turn from there, and ask anyone the directions to the famous Flora Bakery. Bhaijaan Kebabs are right opposite Flora Bakery. The complete address is shop no. 2202, Bazar Chitli Qabar, Opp. Flora Bakery, Delhi-6. The shop is closed on Tuesdays. You can contact Bhaijaan Kebabs on the following numbers – 9811020272, 9899145777. 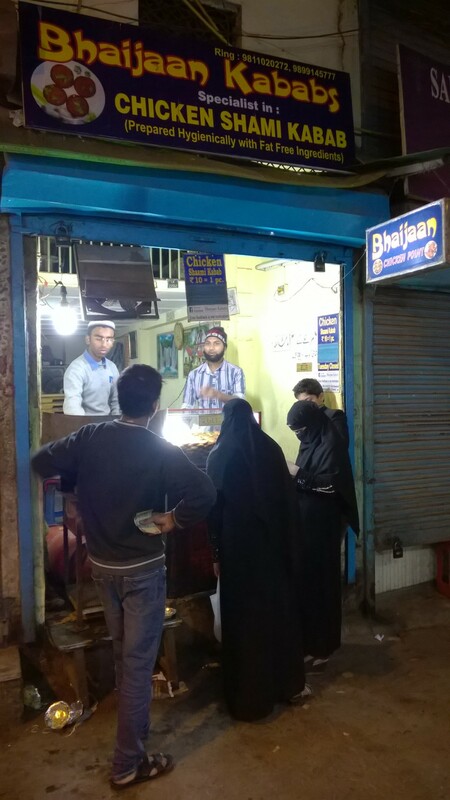 The shop is named Bhaijaan (literally, brother) Kebabs because the age difference among the siblings in Mohd. Shamim’s family was not much and everyone in the family started calling him “bhaijaan”. Bhaijaan, originally a contractor for painting work, used to invite his family and friends for daawat back at home. His kebabs were so delectable that the guests who tasted his kebabs in dawaats convinced him to take his passion of cooking to the next level and open a kebab shop. He opened a small shop selling chicken shami kebabs in a narrow alley in Chitli Qabar. An interesting part of the most of food joints in Old Delhi is that they specialize in a particular dish and pass the recipes from one generation to the next without tweaking the recipes. 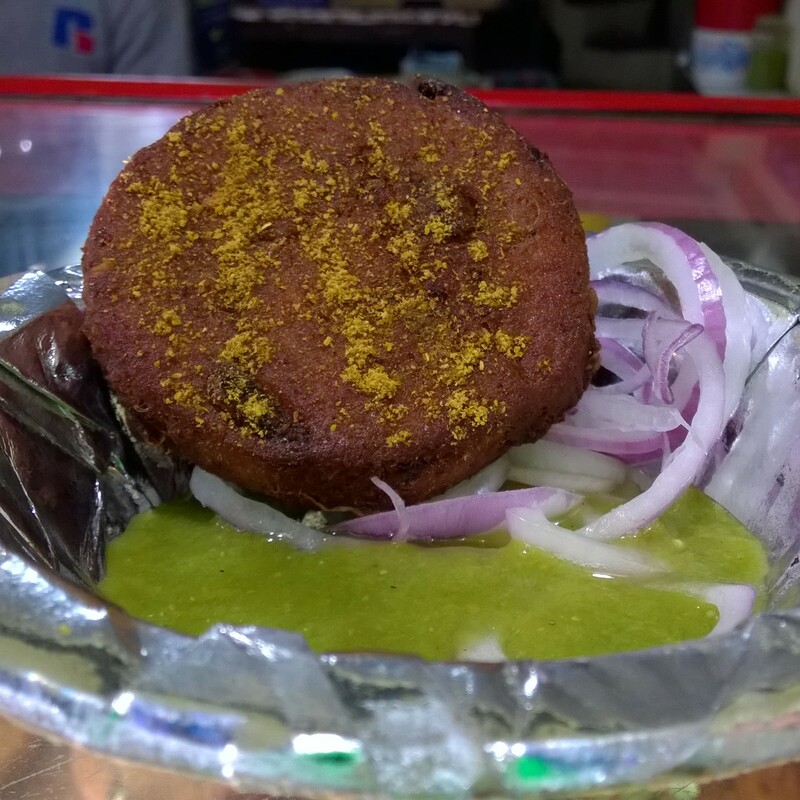 Keeping alive the Old Delhi tradition, Bhaijaan Kebabs sells only one kind of kebabs – shami kebabs. The keema of shami kebabs are made with chane ki daal, dried red chillies, green chillies, and Bhaijaan’s secret spices. A piece of kebab costs Rs. 10 and a kg of keema for shami kebabs is Rs. 200. The kebabs are half fried and kept in a glass box. On order, the shami kebabs are deep fried, chaat masala is sprinkled over it, and is served with green chutney and onion in a dona. The kebabs are crisp on the outside and soft on the inside. The uniqueness of his kebabs are the fibres which one can experience in the first bite. The taste of the kebabs was delicious, and the spices and whole red chillies added to the interesting mix of flavours. The kebab lovers moved in to another lane of Chitli Qabar for sutli kebabs after relishing the taste of Bhaijaan’s fibrous shami kebabs.